On the Bandon genealogy site there is a reference to Rev. Paul Duelos Vicar Ballymodan marrying Frances Marriott (sounds Huguenot) 1882 he died 1717, 5 daughters. It may be a version of Dukelow. The Cork Grand Jury Presentation possibly for 1845 shows a Dukelow’s Cross at Aughadown and elsewhere refers to Dukelow’s pub thee. Ref. IE CCCA/SM714 Date: (11th c.) 1600. – 1990 Level: item Extent: 1 vol. extensive information on the genealogy and family history of this West Cork family. Dukelow was originally Duclos, a French Huguenot surname of locative origin, deriving from the place where the initial bearer once lived or held land. In this instance we have a derivation of the old French terms ‘du’, meaning ‘from’ and ‘clos’ meaning enclosure or farm. Alternatively, there may also have been an occupative origin from the ancient French term ‘closser’ (farmer, large producer of grain or corn), referring to their occupation. Among the numerous variations were Duclaux, Duclous, Duclot, Clos, and Closel etc. During the course of research, the following misspellings have been found: Ducklow, Duklow, Dubelow, Dupelow etc. Among the earliest references in France to the name can be found a Daniel de Cachalon, who was ennobled by letters patent in Pau on 27th April 1609, when he also obtained a house located in Pontacq, called “Duclos”. There was a parish priest, Claude Duclos in the 1640’s and the family Duclos de Bouillas was ennobled in Toulouse in 1748. The disturbed state of the country made it unattractive to the immigrants, but the English government saw in the settlement of Huguenots a means of giving Ireland prosperity and strengthening the Protestant element within the population. Louis XIV came to the French throne in 1643. The Edict of Nantes was guaranteed still, until Cardinal Mazarin died in 1661. Then the persecution of Huguenots began in earnest again. Charles II had just come to the throne of England and during his reign more refugees were sent to Ireland at the expense of the government. In 1674 the Irish parliament passed an act offering letters of naturalisation to the refugees and free admission to all corporations. Under the Duke of Ormond’s vice-royalty, colonies of Huguenot refugees were planted at Dublin, Cork, Kilkenny, Lisburn and Waterford. The settlement of Portarlington gained special protection under the Marquis de Ruvigny. The refugee movement was at its height when the revocation of the Edict of Nantes occurred on 8th October 1685. This resulted in the flight of some 200,000 Huguenots. Over 40,000 went to England and 10,000 went to Ireland. In Bennet’s history of Bandon 1869, there is a reference to Richard Goodman who in 1692 succeeded the Rev. Paul Duclos as vicar of Ballymodan, Bandon. In Raymond Hylton’s book ‘Ireland’s Huguenots and their Refuge 1662-1745’ he suggests that among the Huguenot families worshiping at the Collegiate Church in Youghal, East Cork in 1730 were the Duclos family. The Dukelows could have arrived in Southern Ireland around this time and settled in county Cork. There is a story that a Catholic priest from the south of France by the name of Duclos arrived or was shipwrecked off the coast of Cork in the mid-seventeenth century. He founded a parish and started a family. Dukelows also appear in Ulster. Generally, the Huguenots who settled in Ireland quickly established a reputation for creative and skilled workmanship. Hard work was regarded as a self discipline and a means of averting temptation. This produced Huguenot traits of reverence, chastity, sobriety, frugality, honesty and excellence. These refugees often combined their talent of science and craftmanship by making mathematical instruments, watches, textiles, glass, paper, agricultural products and manufactured goods. Huguenot weavers laid the foundation and developed the Irish linen and poplin industries. By 1800, descendants of the original Huguenots had integrated into Irish Society and were virtually assimilated by the Church of Ireland. In the process, the name Duclos must have been anglicized to Dukelow. Names were often spelt in different ways and Irish or English clerks who did not understand French would have written down what they thought was correct. There is a Memoriala of a deed of 1727, (No 47499) where Peter Duklow servant of John Nash Senior of Brinny, Co. Cork is noted as a witness. This is near Innishannon which at the time had a Hugnenot community and the Christian name Peter is noteworthy. Tradition has it that the first Dukelows came to Durrus via the Bernards later the Earl of Bandon family. At the time they had purchased the lands from the Evansons who were still the landlords and the Bandon Estate did not go into occupation until the 1850s. Still thee maybe a connection. In the early 19th century before the present village of Durrus was built it was referred to as a colony of weavers. In 1818 Thomas Dukelow married Frances Coughlan of Upper Clashadoo (farm now occupied by Johnson family). It is probable that she was the granddaughter of Jeremy (or Jeremiah) Coughlan of Carrigmanus, on the Mizen Peninsula. In 1730 he and his brother-in-law, Nathaniel Evanson, who lived nearby were paying rent to the Bernards of Bandon for a number of townlands. The Coghlanas were a little unusual as an old Gaelic Family they were Church of Ireland by 1600 and had a line of small landowners and clergymen. It is likely that this line of the Dukelows and by inference a lot of the neighboring families have ancestors who were on the Mizen and Muintervara for upwards of 3,000 years. The earliest known Dukelow in our family tree is a Richard Dukelow. Richard was probably born between 1795 and 1805. Around the time of his birth, the population of Ireland began to explode due to the abundance of incredibly cheap food. By 1841 the Irish population was nearly 8.25 million and it was the most densely populated country in Europe. Young couples married early as no savings were necessary. A cabin was erected for little or nothing in a few days and children were a necessity as an insurance against destitution in old age as there was no Poor Law until 1838. The family cabin was usually warmed by a turf fire and, even though the Irish peasant may have slept on the floor, there was plenty of food, potato being the mainstay of Irish cooking. The pre-famine Irish may have been poor but they were not gloomy. Dancing and talking were universal diversions. Richard’s parents have not been identified, but he could have been related to ‘Big Pete’ Dukelow. Legend has it that he was the biggest man in the county at 7’6″. He supposedly had one or two brothers and Richard could be descended from one of these. Looking at the incidence of certain names in the family tree, it is suspected that Richard’s birthplace was Durrus, which is located about 7 miles from Bantry Bay in County Cork. In the Tithe Applotment for the Durrus Tithe for 16th November 1830 two Richard Dukelows are mentioned: one in Droumatinahine and one in Rossmore. In Crotties there was also a Charles, Peter, James and Robert Dukelow and a Thomas in Classadoo. As regards the identity of Richard’s wife, three names have cropped up in research. According to the Irish Records Extraction Database at Ancestry.com, a Richard Dukelow married a Catherine King in the Diocese of Cork and Ross, Co Cork in 1814. A Richard Duclow married a Sarah Williamson in 1830 also in the Diocese of Cork & Ross, Co Cork. Another possibility was Avis Shannon who married a Richard Dukelow. The main contender appears to be Catherine King. The marriage to Sarah Williamson is rather late and Avis Shannon was later found in the US in the 1860 census, so they are less likely. In terms of occupation, he is named as a labourer on his son’s marriage certificate (1859), but it is not stated whether this was an agricultural or industrial labourer. The strongest evidence is that he was an agricultural labourer, as his son or grandson, John Dukelow, is reported to have scared crows off the crops as a boy for a penny. On his daughter’s marriage certificate (1861) his occupation is a butcher. It is possible he was a tenant farmer to begin with and then left the land during the potato famines in the 1840’s. By this time, Richard and his wife appear to have had at least 3 children: John was born first in around 1828. Peter was born between 1832 and 1834 and Mary followed in around 1834. There may have also been an Anne, born around 1840. Local failures of the potato crop had occurred regularly since the 1700s. There had been ‘minor’ famines in 1817 and 1822 and the possibility of another failure in 1845 caused no particular alarm. In fact, at the beginning of July of that year, the crop promised to be a bumper one. However, the first news that the blight which had recently ravaged the North American potato crop had crossed the Atlantic came from the Isle of Wight, where disease had appeared. Suddenly, every plant died and, soon afterward, all over Ireland people were dying by the thousand. The situation was exacerbated by another failure in 1846. Starvation was soon followed by disease. Some people were said to die by the fences and about 40 dead persons were reputedly eaten by dogs in Durrus. Cart loads of corpses were buried in mass graves. Before the potato failure, to leave Ireland had been regarded as the most terrible of fates, but now the people began to flee en masse. It is estimated that a total of a million emigrants went to North America. By the 1840’s as a direct result of the famine half of all immigrants to the United States originated from Ireland. Many of these immigrants went to the largest cities, especially Boston and New York City, as well as Chicago, San Francisco, Hartford, Albany, Philadelphia and Detroit. Even today, many of these cities still retain a substantial Irish-American community while New York City still has more people who claim Irish heritage than Dublin’s whole population. These cities became the conduit through which Irish, both Protestant and Catholic entered American society. However, there was an even larger emigration across the Irish Channel to Great Britain, to Liverpool, Glasgow and the ports of South Wales. There is one story of a ship arriving in Newport, Wales and a great debate raging as to whether the Irish should be allowed ashore as they would spread pestilence throughout Britain. By February 1848 there were 191residents from Durrus in the Bantry Workhouse. Pre famine the population was 3731 in 1841. By 1851 it had dropped to 2003. The number of houses went from 595 to 324. Ireland’s Valuation office conducted its first survey of property ownership in Ireland from 1848 to 1864. This survey became known as “Griffiths Valuation” after Richard Griffith who was the director of the office at that time. The survey was used to determine the amount of tax each person should pay towards the support of the poor within their poor law union. This involved determining the value of all privately held lands and buildings in rural as well as urban areas to figure the rate at which each unit of property could be rented year after year. The resulting survey was arranged by barony and civil parish with an index to the townlands appearing in each volume. Griffith’s Valuation can be used as an excellent census substitute for the years after the Great Famine as censuses prior to 1901 were destroyed. In the Griffiths Report of 1850-1852, there is only one Richard Dukelow in Carrigboy alongside an Avesia Dukelow who may have been a sister or mother. Incidentally, the name Avesia is repeated amongst the Dukelows of Durrus. Inspection of the Irish Reproductive Loan Fund Records reveals that this Richard had fallen on hard times. The Irish Reproductive Loan Fund was a micro credit scheme set up in 1824 to provide small loans to the ‘industrious poor’. Local associations and committees administered the scheme, most often from a small town in a rural area, and county committees oversaw their work. The records of the local associations and county committees are in the The National Archives and cover the years 1824 to 1846 for county Cork. As well as the notes of security for the loans, there are loan ledgers, repayment books and defaulters’ books. The minimum information supplied is address and occupation, but much additional detail is often given in the local association records, including notes on health, family circumstances and emigration. A Richard Dukelow is mentioned. He borrowed 2 pounds on 23rd March 1846. It was secured by Michael Baker of Cruttees, John Dukelow of Aghagouma and Michael Hurley of Ballycomane. It is interesting to note that the Hurley (or Hurely /Herley) family crop up later alongside the Dukelows in Well Street, Poplar, Middlesex, England in the 1861 census. By 26th November 1849, Richard had paid off 14 shillings of the loan, still owed 1pound and 6 shillings and owed interest of 2d. The Constable in charge of administering the loans was called upon to find out his circumstances and Richard appears not to have been in a position to repay the loan. Records state that “He did reside here (in Cruttees) Being poor man Resides at present in Carrigboy being poorly circumstances”. At the some time, others on the same sheet were heading to America and were poor farmers. It is interesting to note that John Dukelow, a shoemaker of Aghagouna also borrowed 2 pounds on 26th October 1846 which was secured by Charles Dukelow and Timothy Daly of Rossmore. By 26th November 1849, he had paid 8s. He lived in Aghagouna on both dates according to the records. Maybe Richard and John were brothers. It is highly likely that some of these are Richard’s relatives. After 5 or 6 generations in Ireland, the potato famines prompted the Dukelows to migrate for a second time. In the 1820/1830/1840 US Federal census there were no Dukelows, but, by the time of the 1850 census, there were two: one in Wisconsin and one in Monroe, New York. From 1860 onwards their numbers in the US swelled. Of the 22 Dukelows in the 1860 US Federal census, one family of seven lived in New York, one family of three in Middlesex, one lived in Queens (aged 17) and eleven Dukelows lived in Calumet. In the 1870 US census there were 37 Dukelows and in the 1880 census there were over 100. Their birthplaces varied, but were mostly Canada, Ireland and just three from England. The details of Richard’s life and his exact fate may never be known, but there may be some clues in the records available. No Richard Dukelows were uncovered in the 1841, 1851, 1861 or 1871 census in England or 1841 and 1851 census for Wales, Scotland and Channel Islands. There are none in the 1840 US Federal Census or in the 1851 census of East and West Canada, New Brunswick and Nova Scotia. There is a Richard Dukelow born approximately 1833, living in Wankesha, Wisconsin in the 1850 USA Federal census. He was working as a labourer on a farm, but he is too young to be relevant. All the evidence points to him remaining in Ireland. He may well have died impoverished and be one of the millions buried in mass graves during the height of the famine. No matching gravestone or death record has been uncovered anywhere. His children were definitely part of the exodus from Ireland. By the 1850’s they had migrated to the British Isles. The trip to the UK was the flight of the very poor that could not raise enough money for a passage to the States or Canada. Crossing to Great Britain was a familiar experience for thousands of Irish, thanks to seasonal harvest work and the demand for labour associated with the Industrial Revolution. Large Irish communities had been established in the cities thanks to the labourers (navvies) who had gone over to dig docks and canals and to work in mills and factories. They provided cheap labour and were often used for strike breaking. In addition, the conclusion of various colonial campaigns meant large numbers of Irish soldiers were discharged onto the frequently unwelcoming streets of London. There were regular services of steamers on a daily basis between Liverpool and Cork. Richard’s children are thought to have entered Britain through the ports of South Wales, as his grandson, John, is known to have worked there for many years. From Wales, many Irish spread over England and Wales, afraid of returning to starvation. Chepstow and Cheltenham on the English border were invaded by the Irish in particular. The brothers may well have arrived in London around 1852 when the Poplar Docks were opened, followed by the Royal Victoria Docks in 1855. As a large part of the workforce simply required brute strength to fetch and carry goods, employment was open to anyone, and the poor immigrants from Ireland provided cheap labour. Their living conditions were awful. Because of London’s high cost of living, several Irish families frequently shared a single room, and when this overcrowding was combined with primitive sewage arrangements, poor ventilation, and few opportunities for washing of either bodies or clothes, the mortality rate among London’s Irish population rose to frightening levels. By 1859, Richard’s two sons, Peter and John, had found their way to London, and were living amongst these Irish migrants. I am sure they would have already known many from home. Peter married Hannah Collins in 1859 and John was a witness. At the time of the 1861 census, John was lodging with his Poplar-born wife, Mary, next door to his brother at 9 Well Street, Poplar. Their surname appears as Dupelow. They were both working as dock labourers. It is evident from Peter’s marriage certificate that neither of them could read nor write. This was the norm at the time. The percentage of males who could read and write in the 1841 Census for Durrus was between 15 and 19%. Having survived the famines, it must have come as a shock when John Dukelow died suddenly on 10th August 1866 whilst he was living at 4 Providence Place, Poplar, which was very close to Well Street. He had contracted cholera, which he had had for 23 hours. There was a major cholera epidemic in London July to October 1866. This followed epidemics in 1832, 1848-49, and 1853-4. Thinking that the disease was spread by the inhalation of invisible noxious gases emitted by excrement and rotting waste, sanitary reformers tried to prevent the spread of cholera by flushing sewers and washing down streets to eliminate the disease. Cholera is primarily water-borne, and the first effect of the cleansing was to make the 1848-49 epidemics even worse than that of 1832. The distribution of deaths in successive cholera epidemics reflected the cleanliness of the water supply in different parts of London and, in 1866, only Poplar was affected with a death rate of 81-160 deaths per 10,000 inhabitants. It is possible that the Dukelows were sympathetic to the ideals of Irish Republicanism. This is based on various pieces of evidence. Firstly, they originated from an area which was the heartland of the Fenian movement. The Fenians were members of the so-called Fenian movement in Ireland and elsewhere, though primarily America and England. They wanted one simple desire for Ireland – independence from British rule. The Great Famine had a massive impact on Ireland. Some in Ireland believed that the government in London – to solve the ‘Irish Problem’ – had deliberately done as little as possible to aid the people of Ireland – a form of genocide – and these people concluded that the only hope Ireland had for its future was a complete separation from Great Britain. If London was unwilling to grant this, then the Fenians would fight for it. Anger against the British government spilled over in 1848. In this year a group of revolutionaries known as Young Ireland launched an uprising against the government. It was a failure. One member of Young Ireland went onto form the secret society that became known as the Irish Republican Brotherhood. Its aim was independence for Ireland. Another went to American and became the leader of a new organisation called the Fenian Brotherhood. It took its name from the Fianna who were a band of Irish warriors of the 2nd and 3rd centuries. The name ‘Fenians’ became an umbrella term to cover all the groups associated with wanting independence for Ireland. By the very nature of what they wanted, those elements within the Fenian movement who were prepared to use violence to advance their cause had to remain secret. There was an attempted uprising in 1867, though it was a failure. The ‘uprising’ was led by Thomas Kelly who had fought in the American Civil War. Kelly did not base himself in Ireland but in London. Here he gained support from the large Irish community that had come to the city during the Great Famine. In December 1867, several Londoners were killed when a bomb planted by the Fenians exploded at Clerkenwell Prison. This caused a wave of anti-Irish feeling in London and elsewhere in England. Against this backdrop, the Dukelows in England are known to have associated with and married into nationalist families such as the Santrys and Swantons. This repeated intertwining of Cork families naturally assumes a common political standpoint. John Dukelow’s death was notified by a Margaret Sawtry/Santry of 51 Wells Street, Poplar. Michael Collins, who played a pivotal role in Irish affairs, leading to the treaty of 1921 that gave Ireland dominion status within the British Empire, was introduced to these ideals by an Irish village blacksmith by the name of James Santry. His background indicates that he could even be related distantly to family member Hannah Collins, wife of Peter Dukelow (stevedore) mentioned later. Generations of Dukelows and Swantons had intermarried in Ireland and would continue to do so in London. In the 1871 census a Mary Santry was found lodging with the Swantons who were known to have strong associations with the Irish Brigade, a nationalist group that pre-dated the famine and supplied manpower for many conflicts with Britain such as the American civil war. Across the Atlantic and in spite of their protestant outlook, Dukelows who immigrated to America are known to have been instrumental in forming an Irish political group in New York called ’99 cousins’. This group was the subject of a newspaper article in Rochester, New York and identified strongly with the historic Catholic experience, the nationalist political agenda, and possibly the more militant republican agenda. The most compelling piece of evidence comes directly from Richard Dukelow’s grandson, Peter, who scribed some notes on The Committee of Spanish Bondholders letterhead at the beginning of the 1900s. They talk of the Irish Brigade and a peasant called Thomas Parr. The reason for these historical notes is unclear, but suggest an interest in Irish history and the plight of the poor and oppressed. His reference to the Treaty of Limerick and the end of the Irish resistance to William III displays pro-Irish nationalist sympathies. In this regard, he would not have been alone, Irish poet W B Yeats was protestant and also a member of the Irish Republican Brotherhood, a secret oath-bound military organization devoted to achieving an independent Ireland. Peter can hardly be blamed for any pro-independence leanings as the Great Famine would have left deep scars in his family. No doubt, as a young boy he would have heard about the misery of the famine and been familiar with such songs as ‘Black ’47’, named after the most severe year of the famine. The deaths, the misery, rural depopulation, indifference of the British government and the near-extinction of the Irish culture and language, made the Great Famine undisputedly a pivot point in the history of Ireland and the Dukelow family. In 1937 the National Schools in Ireland asked the children to collect local folklore rom the older people in the area, the results are in the University College Dublin archives and some are on line, included are the following contributions from Kathleen, Sarah, Winnie and Annie Dukelow from Durrus. Takes a little while to open. John and Elizabeth Dukelow (Thomas’ parents) were one family of a cluster of Protestant families that were tightly interconnected. 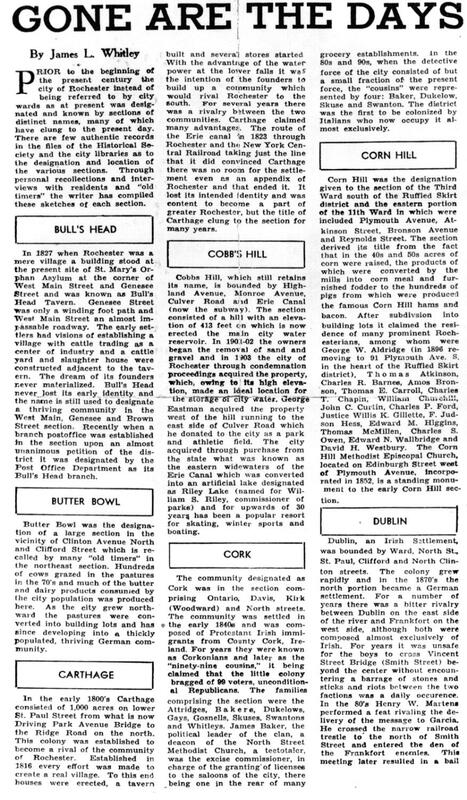 Catholic tenant farmers dominated the population in much of County Cork, Ireland. But, as a result of some artifacts of ancient land ownership rights, there was a small concentrated group of Protestants tenant farmers in far western side of Cork. Because of so few Protestants families around them, these families formed a tight and complex social network with each other. Nearly all the Protestant families there were either related by blood or by marriage. These inter-family complexities occurred for many generations, with the subculture reinforced by Penal Laws (see the History Back Drop on Penal Laws). From the outside this group appeared to be one large extended family. Family names in this cluster included the Swantons, Goods, Roycrafts, Loves, Youngs, and likely also included the Gallaghers and Nicholsons. These strong inter-family relationships continued when families emigrated from Ireland to New York State and held fast as some families from this cluster eventually settled in Wisconsin. One example of this interconnectedness is revealed around the Christening and eventual wedding of Thomas and Elizabeth’s first born, Mary Ann. Mary Ann’s baptismal sponsor when she was three months old was Thomas Good. Twenty-two years later, the same Thomas Good became her father-in-law! Mary Ann married Frank Good, son of Thomas Good, in the year 1865. This wedding appears to have been an “arranged” marriage. Mary Ann lived in Dodge County and Frank lived in Dane County. This distance of 60 or more miles was a major obstacle to romance in the 1860s! Imagine the effort it took to travel that distance (and back) by horse. Frank and Mary Ann had only met each other two or perhaps three times before their wedding. However, they apparently got along well as there marriage lasted over 59 years! The strong inter-family relationships also became a part of the political picture in Rochester New York during the 1800s. The Dukelow family was part of what was labeled the “99 Cousins” which controlled much the Rochester City government in the 1840s and 1850s. More on what were called the “99 Cousins” will be discussed later. In Mazier Brady’s history of the Dioceses of Cork, Volume 1, p 73 dealing with the Parish of Desertmore he places Paul Duclos as Rector in 1689 and also P. Island, Ross. Originally from Metz in France. 99 Cousins, Rochester, New York. Father Quin’s (PP Durrus) application for National School, 16th November 1830 ED1/13/74/2, signed by for Roman Catholics Richard O’Donovan, Timothy O’Donovan, Richard Tobin, Edmond Tobin, Daniel Daly, Richard O’Donovan, John Murphy, John Carthy, Thomas Cormack?, Elias Roycroft, Andrew Caverly, Richard Caverly, Protestants E. Evanson, Richard L. Blair, Thomas Ferguson (Clashadoo), Thomas Duklow (Clashadoo), Charles Ducklow, John Ducklow. Rev Alcock of the Church of Ireland was asked to consent but declined but his parishioners signed. He is listed as a Cess Payer for the Barony of West Carbery in 1834 with other locals including Rev. Edward Alcock of Clashadoo and William Vickery of Ballycomane. This nomination was by the County Grand Jury to sit with Magistrates on road presentments. Probably from Crottees married into Clashadoo on his 1810 marriage to Frances Coughlan. She is probably of the extended Coughlan family of Carrigmanus likely pre Celtic in origin. Converted to Protestantism c 1600 associated with Hulls and Boyles. Jeremy/Jeremiah of the family an Attorney, seneschal and manager of Devonshire Waterford Estate renting with his brother in law Nathaniel Evanson from c 1720 including Clashadoo. William Vickery member of Select Vestry St James, Durrus, with Thomas Dukelow. 1845 Quarter Session Juror. The Durrus Dukelows part of an emigration of Durrus and Schull Protestants to Rochester, New York. Through the Republican Party they created a political machine known as the ‘99 cousin’ which dominated city government in the mid and late 19th century a pelia of the Irish Catholic machines in other US cities. The Catholic branch of the family descended from John Dukelow emigrated to East London and with Durrus Swantons and Hurleys were active as Fenians in the 1860s. Later one of the extended family provided accommodation in a lodging house to Michael Collins when he went to London to work as a Post Office clerk. Displaying results 1 – 25 of 25. Will narrow your search by showing results where this name also appears. Extraordinary to find my great aunt Mary Ellen Walsh and g uncle Francis Dukelow, RIC policeman in Tipp on this site! I was looking because we have Mahoney family – Cian / Keane / Charles Mahoney husband of Ellen Driscoll, of Ballycommone, Durrus and Schull. But great stuff, would love to hear from anyone else with connections to these families. I’m wondering if Francis Dukelow became a Catholic on marrying Mary Ellen most probably at her home in Wexford Town in about 1900. Wow, truly astonishing research! Wish I could hire Kerry to research my Connolly and Carey lines in Schull and Bantry Bay. What I found particularly interesting was that marriages in the late 1840’s and early 50’s were early, as I had always heard that the Irish married late due to poverty. The information comes from Muintervara marriage and birth records, Irish Census records of 1901 and 1911, immigration records from EllisIsland.org, and U.S. census records. Jeff Ducklow at irishtree.blogspot.com has the US history of the Dukelow/Ducklows. Also, the Connell, Salter, Attridge, and others intermarried with the Dukelows in the Schull area and in North America. Sarah williamson was my great grandfathers sister. Her name is on a grave stone at st james church durrus. She is not there was it is in memory of her. My great granfather was robert. And had married susan shannon from bralish, durrus. Their eldest son richard shannon williamson was my grandfather.the whole family moved to ballinhassig cork. To farm. Robert shannon married and moved to timsbury bath united kingdom. And is buried there. I have vited the church in durrus. Seen the home in dromataniteen. And while driving up through brahalish. Asked for directons only to find it was a dukelow and went back to find the family history there at their farm overlooking dunmassus bay. That was a small world. I was told sarah and her husband emigrated. And her name was put on the headstone. Hello Rosemary et al. We share the Williamson connection, I am very sure. My line came to Canada in the 1830’s from Rossmore. Robert Williamson , 3rd great grandfather had died, but his widow Mary and 7 grown children immigrated. M y2nd gr. grandfather was Richard Williamson b c 1800. There was a second Richard Williamson in the Ontario area identified as a cousin. I do believe this is from the Brahalish line. I have seen a photograph of a Robert Williamson , police man of Rochester NY who bears a strong resemblance to a great aunt of mine. my email is marlier at iCloud dot com if you are interested in further yarning. great-grandson of a Williamson from Wexford. Anything on the Harringtons? John and Cath Hurly married 1800 ish son Patrick came to UK to escape famine………was baptised by the legendary Father R. Quinn in Jan 1825……did they live in a house or something more humble? Is it possible to find a site/living area today by visiting/pilgrimage etc. ?